Cognitive problems are the rule rather than the exception for people with bipolar disorder and so the idea of brain training for bipolar is an attractive one. There are a number of commercially available brain training courses. Probably one of the most comprehensive was developed by a company called Posit Science. Its current flagship product is a subscription-based online program called BrainHQ. One important feature of this company is its commitment to sponsoring good quality research on its products. Recent large studies have supported its effectiveness in improving cognition in patients with bipolar, and in improving cognitive function in the elderly. I am sitting in front of my computer. My eyes are wide open, and I am super alert — wired, more like it. I have been staring intently at the screen for half an hour, tracking moving balls and fish, memorizing cards and meaningless syllables, and mentally rotating complicated objects before they quickly disappear. If these activities sound stressful, they are, but they are also fun, and, best of all, reportedly great for your brain. Scientific studies show that brain exercises like these can improve cognition. And for those of us with mood disorders — and likely to experience some cognitive problems — there is good news: A recent study has found that computerized brain-training for bipolar patients significantly improves their processing speed, visual learning and memory (J. Clin. Psychiatry. 2017 Oct 17. pii: 17m11476. doi: 10.4088/JCP.17m11476). 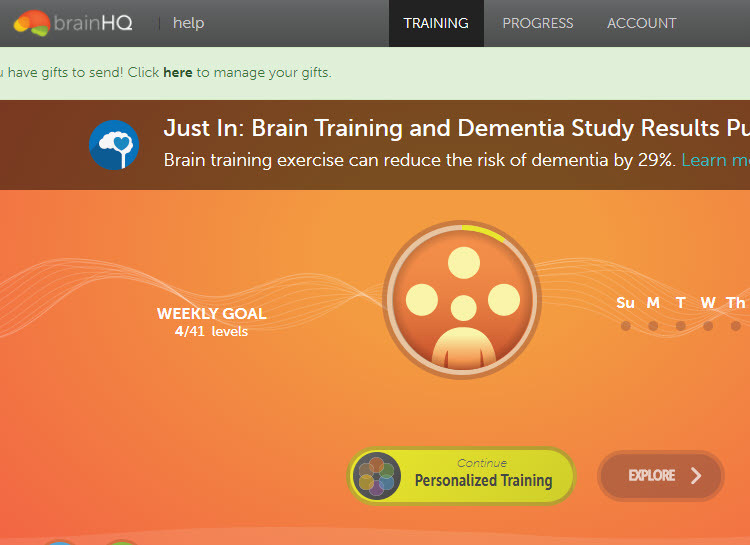 The participants in this study trained using a 70-hour course of exercises from BrainHQ, which is an online, interactive brain-training program (brainhq.com). I was intrigued by these results. Having struggled with (unipolar) depression for several years, I sometimes fear that my brain is not as sharp as it used to be, that I have lost my edge. I therefore decided to give the brain exercises from BrainHQ a try. According to the BrainHQ web site, you may think of it as “… a personal gym, where you exercise your memory, attention, brain speed, people skills, intelligence and navigation skills…”. The program is available for both desktop and mobile platforms; I opted for a subscription ($14/month), which gives you full access to all of the program’s features, but you can also check out a few of the exercises without paying anything. I embarked upon the exercises with some trepidation, mobilizing my growth mindset and reminding myself that a less than stellar result wouldn’t be a disaster, just an opportunity to learn and improve. And improve I did. I was astonished by how, after a few tries, I was able to perform tasks that initially seemed daunting. I quickly increased my processing speed for both visual and auditory challenges as well as my capacity for remembering rapidly moving sequences of cards and rotating series of numbers. Working against the clock, the exercises can be nerve-racking, and progress was not uniform. But when faced with the more difficult exercises, I found myself devising strategies for how to improve, feeling a jolt of triumph every time my efforts paid off and resulted in a better performance. The progress I have made (from daily half-hour sessions for about a week) is gratifying, although it is too early to tell if these improvements will translate into my life in general. Importantly, however, I have already learned two lessons that I am sure will benefit me. The first one is that seemingly insurmountable challenges may yield with a little persistence. Not surprising, perhaps, but encouraging to experience firsthand when your depressed mind tries to tell you otherwise. The other lesson I learned has to do with the attitude with which I approach challenges: I am starting to value improvement rather than a perfect score. This came about because the program is designed to have you working on your edge, ramping up the level of difficulty as soon as you start improving, so you rarely have the feeling of complete mastery. Curiously, brain exercises are not usually part of even the most rigorous fitness regimens. We seem to take for granted that our brains get the exercise they need from our regular daily activities, and we accept whatever level of functioning our brains deliver. But we could probably all benefit from a little tune-up, so why not challenge yourself and add brain exercises to your workout routine? The games are fun and the format is focused entirely on self improvement… And it is well designed graphically. Here is a very short clip. If you are interested in trying Brain HQ’s brain training for bipolar please let your clinician know. Lewandowski KE, Sperry SH, Cohen BM, Norris LA, Fitzmaurice GM, Ongur D, Keshavan MS. Treatment to Enhance Cognition in Bipolar Disorder (TREC-BD): Efficacy of a Randomized Controlled Trial of Cognitive Remediation Versus Active Control. J Clin Psychiatry. 2017 Oct 17. pii: 17m11476. doi: 10.4088/JCP.17m11476. [Epub ahead of print] PubMed PMID: 29045770. Rebok GW, Ball K, Guey LT, Jones RN, Kim HY, King JW, Marsiske M, Morris JN, Tennstedt SL, Unverzagt FW, Willis SL; ACTIVE Study Group. Ten-year effects of the advanced cognitive training for independent and vital elderly cognitive training trial on cognition and everyday functioning in older adults. J Am Geriatr Soc. 2014 Jan;62(1):16-24. doi: 10.1111/jgs.12607. Epub 2014 Jan 13. PubMed PMID: 24417410; PubMed Central PMCID: PMC4055506.